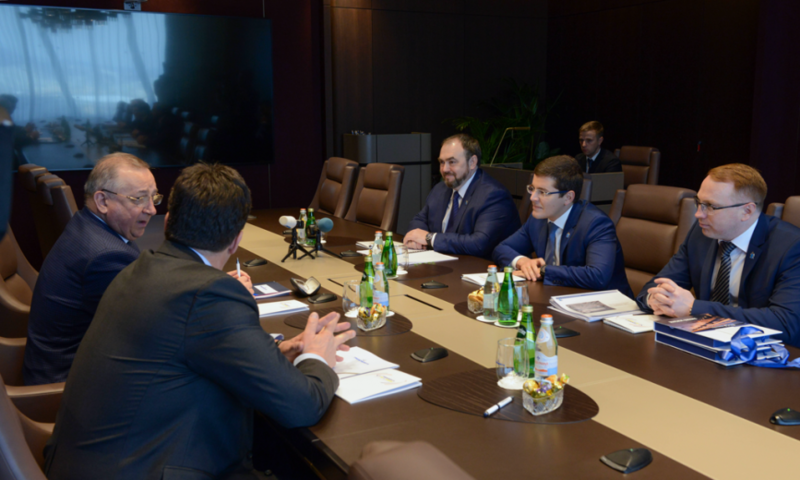 Participation of the company “Transneft” in social projects in Yamal was discussed by the governor of the region Dmitry Artyukhov and the chairman of the board, the president of the company Nikolay Tokarev. In particular, the talk was about construction of two sports objects — a hockey court and a swimming pool — in the village of Korotchayevo (Noviy Urengoy). These new objects, which are extremely necessary for the remote area of Noviy Urengoy and construction of which was repeatedly requested by residents, will appear thanks to interaction of the region and “Transneft”. Dmitry Artyukhov thanked Nikolay Tokarev for considerable contribution that the company makes to advancement of social and economic projects in the arctic region. “Activity of “Transneft” plays an important role in development of Yamal. The company creates strategic infrastructure for hydrocarbon extraction, what allows generating revenues for budgets of all levels, including the federal one, in Yamal. In recent years “Transneft” has fulfilled major projects in our region. First of all, “Zapolyarye – Purpe”, which has already allowed significantly increasing extraction and continues contributing to its increase”, said the head of the region. According to Nikolay Tokarev, “Transneft” plans further to develop social projects in Yamal. On the territory of its presence the company creates infrastructure necessary for comfortable life of Yamal residents. In particular, it includes transport and municipal objects, participation in solving of a housing issue, as the press-service of the governor of Yamal informs. At the end of 2018 the modern sports complex “Arktika” built under the agreement of the region and the company was opened in Korotchayevo. In 2016 “Transneft” input to operation the Russia’s northernmost oil pipeline “Zapolyarye — Purpe”. Its construction allowed involving the largest oil fields of Yamal to development – the East-Messoyakhskoye and Pyakyakhinskoye. About 1.5 thousand employees of the company work in Yamal. In accordance with the agreement on cooperation with Yamal-Nenets Autonomous Okrug, “Transneft” builds objects of municipal, social and housing infrastructure, as well as necessary objects for reliable operation of the oil pipelines “Purpe — Samotlor” and “Zapolyarye — Purpe”.